Panna cotta means cooked cream in Italian. The vinegar reduction used here brings a zingy, refined punch to the berries, and it pairs extremely well with the creamy taste of the strawberry panna cotta. Just be sure not to cook the reduction on too high a temperature, otherwise it will taste bitter and remain vinegary. I have quite a few acquaintances who are allergic to nuts, so for equality’s sake I used tofu here instead of the cashew cream the vegan world loves so much. If you would rather go with cashews, soak the raw cashews in a generous amount of filtered water overnight. Drain and rinse them, and blend them with just enough water to get to the texture of firm silken tofu. You will need approximately 1 cup (120 g) raw cashews to yield 8 ounces (227 g) of cashew cream to replace the tofu in this recipe. To make the berries, place the vinegar and agave in a small saucepan. Bring to a low boil, reduce the heat and simmer until reduced to about 3 tablespoons (45 ml). You can eyeball this; the reduction should be thickened and light golden. Be sure to stir frequently while simmering. Reducing the vinegar will take approximately 8 to 10 minutes. Remove from the heat and add the vanilla. Set aside to cool. Once cooled, and only 30 minutes before serving the dessert, gently fold the berries into the syrup. 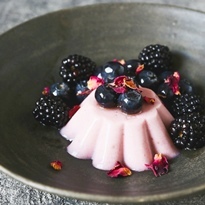 To make the panna cotta, place the berries and cane juice in a heat-proof medium-sized glass bowl. Gently fold, cover and leave at room temperature for 30 minutes. Combine in a small blender with the agave, vanilla and salt. Blend until smooth. Strain through a fine-mesh sieve to remove the seeds. Transfer back to the medium bowl. Very lightly brush eight 3 ¼ x 1 ¼ -inch (8.3 x 3.2-cm) mini brioche molds (or any mold of similar size) with oil. Set aside. Place the coconut cream, tofu and lemon juice in a blender. Blend until smooth. Transfer to a small saucepan. Whisk the agar into the mixture. Bring to a low boil, reduce the heat to low and cook for 5 minutes to activate the agar. Pour this mixture on top of the strawberry mixture, and whisk to thoroughly combine. Divide among the prepared molds. Let cool to room temperature before transferring to the refrigerator to firm for at least 3 hours. Remove the panna cotta from the molds by shaking gently to coax them out. If they resist, use a toothpick to help release them. Serve with the berries, and add rose petals as decoration if desired.